David Wolter '04 discusses his work during the reception for his retrospective exhibition, "A Viking Inside," on display at the Eide/Dalrymple Gallery. 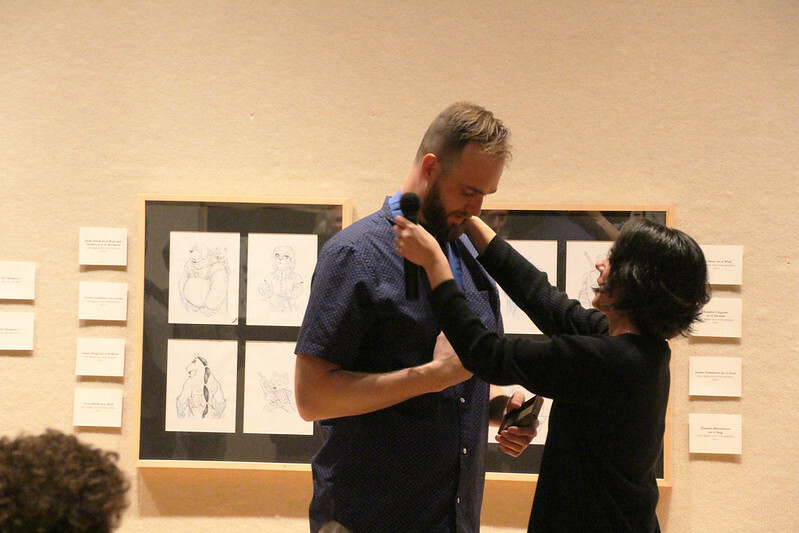 David Wolter '04, an award-winning story artist for DreamWorks, was awarded the prestigious Harold Spitznagel Medal for Achievement in Art on Thursday during the reception for "A Viking Inside," a retrospective exhibition of his work, now on display in the Eide/Dalrymple Gallery. The award, the highest honor presented by the Augustana Art Department, is bestowed only occasionally and is designed to recognize student-artists who demonstrate the highest standards of excellence in their artistic endeavors throughout their Augustana careers. Wolter is only the second postgraduate to receive the honor. Longtime Augustana Art Professor Carl Grupp received the award in 1995. "I became a cartoonist because Plan A failed," he wrote. "I was supposed to be a basketball star, major in business, make gobs of money and have great hair! When I arrived at Augie to enact my plan, I discovered to my dismay that I wasn't that good at basketball and was even worse at staying awake in microeconomics class." "To this day, some of the highest praise I have for Augie is that it's a great place to fail. As I was picking up the pieces of who I thought I was, I found a piece I'd forgotten — that I love to draw and tell stories. And my liberal arts education was nimble enough to pivot and meet me there. Goodbye business; hello creative writing, world-making mythology, and all the visual arts I could handle!" As a student, Wolter served as the cartoonist for the Mirror, the Augustana student newspaper, and developed a comic book during an independent study course with Grupp, who taught at Augustana from 1969-2004. Grupp, who was on sabbatical during Wolter's senior year, nominated Wolter to receive the award in conjunction with his return to campus for his exhibit, which coincides with Viking Days, Augustana's annual homecoming celebration. "Carl Grupp brought the idea to the Art Department that we should consider giving David Wolter the Spitznagel Medal during Wolter’s homecoming exhibition," said Dr. Lindsay Twa, director of the Eide/Dalrymple Gallery, associate professor and chair of the Art Department. "The Harold Spitznagel Medal for Achievement in Art came about through the longtime friendship and collaboration of well-known architect Harold Spitznagel and Palmer Eide, one of the founders of Augustana’s art department. They envisioned the medal as a means to raise up, celebrate and recognize the achievements of artists who exhibited an unusually high standard of excellence in their artistic endeavors. This award is not given on any regular basis, but rather is only given to an individual who stands out over a period of time. It was last awarded in 2014," Twa said. "It is unusual for the award to be bestowed on a postgraduate ... but with David back on campus for his retrospective exhibition, the Art Department has the opportunity to bestow this award on a deserving and dedicated alumnus artist." On Friday, Oct. 13, Wolter will again be recognized for his achievements in the world of art when he is inducted into Augustana's Performing and Visual Arts Hall of Fame. In 2014, he received the Augustana Horizon Award, an honor recognizing young alumni (graduates of the last 15 years) who have quickly demonstrated outstanding vocational achievement, have provided faithful service to their community and/or church, and who exemplify one or more of Augustana’s core values. See "A Viking Inside," a retrospective exhibition of David Wolter's work, now on display in the Eide/Dalrymple Gallery through Saturday, Oct. 14.